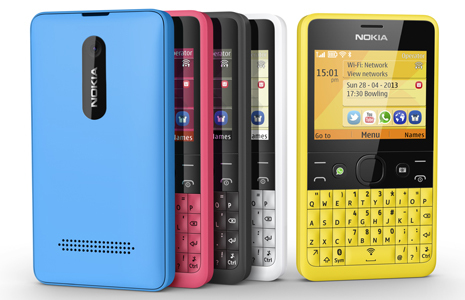 When Nokia teased a QWERTY device, we all assumed it was an ASHA device and not a Windows Phone. Nokia met our expectations as they just announced the Asha 210.
for fast access to instant messaging. To celebrate the Nokia and WhatsApp partnership, WhatsApp is offering their service for free on all Nokia Asha 210 devices with the WhatsApp button for their lifespan. Combined with Facebook, Twitter and support for popular email accounts such as Gmail, the Nokia Asha 210 is designed to ensure that people are never more than a few clicks away from their friends and family. - Self-portrait – for perfectly centred self portraits, even without a front-facing camera. The built-in voice guides the user to ensure they are in the frame, before taking the shot.- Fast editing of images directly from the camera app and easy sharing of images to social networks. Asha 210 is around 72 USD and it is expected to start shipping in the second quarter of 2013. Read more about the Nokia Asha 210 on Nokia Conversations: http://conversations.nokia.com/?p=118710. My dream phone at last.Nokia is the best.